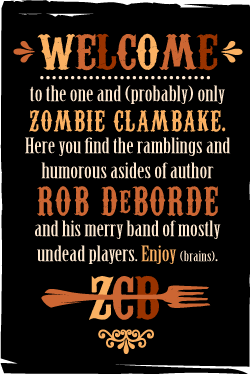 Zombie Clambake: How Did I Get Here? Or, more precisely, how did I become a writer of scary stories? Good question. I always wanted to tell stories. I wasn't always a writer, but I definitely spent a lot of time making things up. I was an artist first, and then a designer. I studied graphic design in college (Cal Poly San Luis Obispo) and loved it. Not surprisingly my senior project involved a series of illustrations for a book . . . that I also wrote. I'm pretty sure it was awful (the writing not the art). It was the story of what happens to Death after everyone on Earth dies. If memory serves he ended up walking around the world until he stumbled upon a small house in the desert. There he found a change of clothes, a couch, and a television that played nonstop eighties sitcoms or some such nonsense. Like I said, awful. A few years later I started writing screenplays. In 1995 I actually wrote a good script. How do I know it was good? When I read it I got lost in the story. This was also about the time I decided to get an agent and make my millions in Hollywood. SPOILER ALERT: I did not make millions in Hollywood. I did write a bunch of scripts, none of which were made into movies. How close did I come? I sold a paragraph to Paramount Television that they used as the basis for an episode* of Star Trek: Voyager. Millions, no. Paid writer, yes. Around the turn of the century (how cool is it to be able to say that? 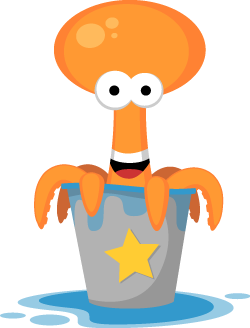 ), I started a Flash-based animation company with a friend called 8Legged Entertainment. Our first property was Deep Fried, Live! an online cooking show staring an accident-prone eight-legged chef named Tako the Octopus. We had some success, won some awards, and ultimately blew it because we didn't know the first thing about the business side of the business. Tako did get me an agent (Hey Michael!) and a breakfast meeting with Alton Brown of the Food Network. He liked the show and needed a writer for his own show Good Eats. Ladies and gentlemen, that's how I became a food writer. I made a cartoon about a cooking octopus—no training, no cooking school, no long hours over a hot stove—and then I get to write about sweet potatoes, the history of meatloaf, and forensic food science on TV. Plus I got a book deal. Boom! Overnight success ten years later. Or something like that. I spent five years writing for Good Eats. 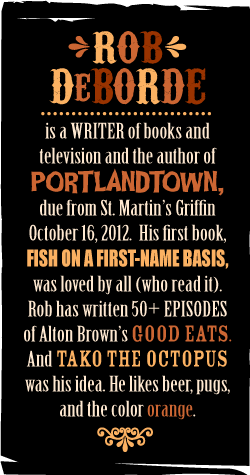 My cookbook, Fish on a First-Name Basis, came out in 2006 and received some very nice reviews. If you like fish and are more than a little curious about what make them so tasty I highly recommend it. After the book came out I spent a few years doing foodie things, but eventually I found my way back to fiction. I couldn't stay away. Could you? What else have I done? If you look closely you might find my name in the credits for a few high-profile video games. I wrote a few more movie scripts, one of which is still floating around out there with a director and no budget. I've also done quite a bit of graphic design work to pay the bills. (Yes, I did co-design the San Jose Sharks logo.) Eventually I wrote a novel. 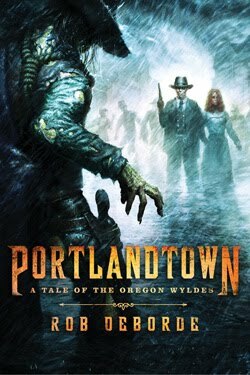 It was a big deal to sit down and finally start writing what would became Portlandtown. I'll tell you about that sometime soon. *BTW, the ST:V episode was called "Living Witness" (Season 4, Episode 23). Don't bother looking for my name in the credits as I didn't get any. The gave me a "premise fee" which means they liked my idea but didn't want to pay a lot for it. Whatever. Still got paid.